Yesterday I blogged about how the residents of the town of Dachau did nothing to help the prisoners in the Dachau concentration camp. Or at least, they didn’t do enough. This makes visitors to the camp today very angry. Today I am writing about how the citizens of Dachau were punished by the American liberators because they had allegedly ignored the suffering of the Dachau prisoners. 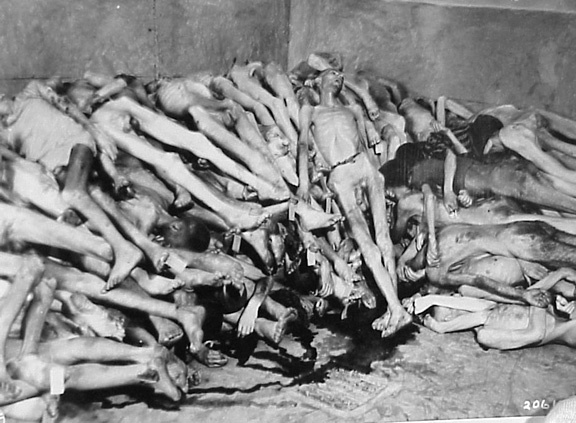 According to Harold Marcuse, in his book Legacies of Dachau, after the liberation “a group of Dachau Nazi elite was forced to tour the Dachau crematorium on 8 May 1945.” There they were made to look at the naked, emaciated bodies of the innocent victims of Nazi barbarity, piled up in the mortuary room right next to the gas chamber. 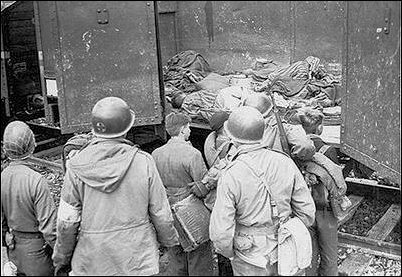 Young boys in the Hitler Youth were brought to the camp and forced to look at the corpses on the Death Train. A film, made during a visit of German citizens to a concentration camp, was included in a movie called Todesmühlen (Death Mills). This movie was part of the re-education program for the German people, who were made to feel personally responsible for what happened in all the concentration camps. Steinbacher’s book was written and published in German under the title: Dachau, die Stadt und das Konzentrationslager in der NS-Zeit: Die Untersuchung einer Nachbarschaft (Munchner Studien zur neueren und neuesten Geschichte) It is no longer in print. Father Pfanzelt died in 1958 without ever confirming or denying that he had saved the town from the wrath of the Americans. From 1942 until the end of the war, the parish of St. Jakob had organized a large-scale project to send food packages to the prisoners at the Dachau concentration camp. Farmers and business owners in Dachau donated food and medicine to the prisoners, which the SS allowed them to send to the camp. But it wasn’t enough. The photo below shows French Resistance fighters after they were liberated from the camp. In the last days of the war, the Nazis released many of the clergymen in the camp, a few weeks before the American Seventh Army arrived to liberate the camp. 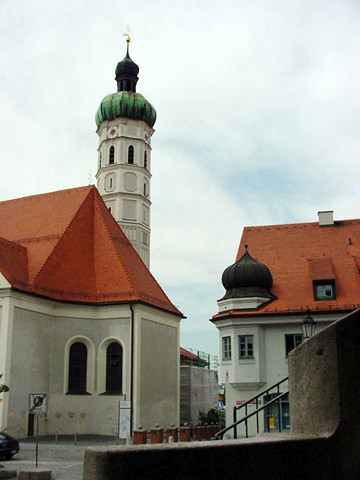 The German and Austrian priests who were released from the camp on March 27, 1945 came to the parish church of St. Jakob’s where they were cared for until they were strong enough to get back to their homes. 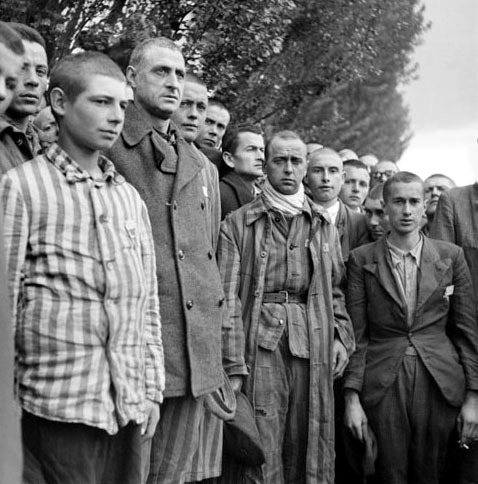 According to the The Official Report, the townspeople admitted to the Americans that they knew the camp existed, that they saw work-details of inmates passing through the streets under guard on their way to the 12 work sites in the town, that “in some instances” (particularly in the years 34 and 35) the SS behaved brutally – towards the townspeople. According to The Official Report, “this statement would seem to represent the most popular attitude in the town of Dachau at present.” The townspeople told the Americans that in the last years of the war, large numbers of the concentration camp guards were men who had been drafted into the SS against their will. German prisoners in the Dachau camp were also recruited to fight on the battlefield with the Waffen-SS in the last days of the war. These people admit that the town as a whole did a thriving business as a result of the presence of the Camp and its attendant SS “Bonzen” (Big Shots) – and it is perhaps not without significance that the most outspoken anti-Nazis were people who, so to speak, could afford to be so by reason of the fact that their business did not bring them in daily contact with the SS. The day before the Dachau camp was liberated, acting Commandant Martin Gottfried Weiss had opened up the well-stocked warehouses in the SS Training Camp, and the food and other supplies were distributed to the starving inmates by the Americans. Dachau residents had to fend for themselves, and were forced to provide food for the released prisoners as well. After the Dachau camp was liberated, the American army appointed Dachau resident Hans Zauner as acting mayor, according to Harold Marcuse, who wrote that the outraged occupying soldiers required the townspeople to supply clothing and foodstuffs for the liberated inmates, and threatened the acting mayor with dire consequences if he did not fulfill the quotas. In his memoirs Zauner described how on 1 May two soldiers, without a word of warning or explanation, pulled him out of his office, pushed him down the stairs and set him on the hood of their jeep, whereupon they took the 59-year-old for a “joy ride” around the hilly town. Eventually the GIs brought Zauner back to city hall and let him dismount. My father was a Dachau Liberator. He told me once before he died that he would remember the smell as long as he lived. The bodies were burned in order to prevent the spread of disease. Brilliant reply “furtherglory”. Are you somehow saying that your clarifications/corrections makes Dachau some sort of “pro-life country club”??? Could you imagine an American saying that the shackles on slaves were made of a softer iron that what was originally claimed by historians (never-mind the testimony of the slaves themselves)…therefore slavery is a lie. Sounds absolutely ignorant, doesn’t it. And, I have absolutely no love for modern-day self-entitled African Americans….I just think what happened to their ancetors was real, and horrible. What trash, Hermie. Thought I might have to put my boots on to wade through your post. Hermie is a perfect example of the persistence of stupidity and selfishness that endures decades after the holocaust. This is what gives rise to inhumanity and atrocities…and just plain evil. Hermie is incapable of shame. Heil Hitler, you scum. If it wasn’t for Hermie, I would keep forgetting that Dachau was originally an upscale country club that those evil Americans demonized due to their jealousy. And, those damned Jews (the ones that were left) somehow all got together and told the same terrible stories. …it’s incredible that after the amount of evidence given by the entire democratic world, that there is still people out there like this. They’re better off admitting that it happened, and that they still want to rid the world of Jews. In these cases, they just sound flat out stupid. We frequently choose to ignore what the word “Human” actually means and constantly confuse the two terms “inhuman” and “inhumane”. My personal belief is that it is the horror borne of this ease of confusion that haunts us still. I am no historian, sociologist or “ologist” of any kind….but I am a Human Being, a Father, partner lover, neighbour, friend et al…..I live in a quiet cosmopolitan suburb of North Manchester UK. 70% of my community are Jewish, Eastern European or Asian…….but imagine if one day….just one day, my government, my local council, my local Constabulary said that I could simply go across the road to my local Asian owned Off Licence and just help myself with no consequences whatsoever. Where and when would my “humanity” kick in – or shut down?? Not a particularly great example – I admit, but I want to illustrate (yet again) that you cannot put yourselves back in the shoes of Dachau’s German population. They where and are “Human” – they feel guilt shame and ignorance on more levels than most of us 21st Century citizens could ever count. My family tree contains both a german Army Officer, a British Army Officer and a Polish Slave Worker – I have a well rounded view on this. I am most proud of my Polish connections – quite a few openly admit that they did what they did because the men in collars and ties said it was “ok”. Would you do any different now? I didn’t know that there was slavery in Poland. When you say “quite a few openly admit that they did what they did” are you talking about the Polish people who killed ethnic Germans in Poland? Is it true that they cut open the dead bodies and stuffed dead rabbits inside? If so, what did this symbolize? Are you saying that “men in collars and ties” said it was O.K. to murder ethnic Germans on Bloody Sunday? I can understand why you are proud of the Polish people in your family tree. Or are you talking about the Polish Resistance fighters who never surrendered, but kept on fighting as illegal combatants? The nerve of the Germans for putting these brave fighters in concentration camps when they were captured! The good citizens of Dachau should have stormed the Dachau camp and let the illegal combatants out so that they would fight again. Good for you for choosing to live in a community where only 30% of the inhabitants are British. Down with nationalism! You are an excellent writer and I enjoyed reading your website. I don’t think that the Germans were making “a gigantic attempt at denial” in April 1945 when they evacuated some of the Jewish prisoners at Bergen-Belsen. The three long “horror trains” were not making their way across Germany in an effort to hide the fact that Jewish prisoners were emaciated and close to death. The Jews were put on the trains, bound for Theresienstadt, so that they could be saved from death in the Bergen-Belsen camp which had a typhus epidemic in progress. If Himmler had wanted to hide the fact that prisoners were dying at Bergen-Belsen, he would have ordered the trains to be filled with the 10,000 dead bodies that were found in the camp. He would have ordered all the prisoners, who had typhus, to be shot and their bodies hauled away on the trains. I think that Himmler was planning to use the Jews, who were evacuated, in his negotiations with the Allies. Remember that Bergen-Belsen was an exchange camp and there were Jews at Bergen-Belsen who were exchanged for German prisoners in England and America. Thanks, and yes, you are right about this. My lens got in the way of what I’m trying to look at. I tried to fit it in the framework of “Denial” – I guess one could think of Himmler’s “negotiations” themselves as form of denial, but these people were sent for a specific reason as you say. I’ll write it up more carefully and read more, first. I just started reading your blog. Excellent! On second thought, this woman was more like 7 years old in 1945. Harold is the son of Herbert Marcuse, one of the main pillars of the “Frankfurt School” Jews who fled Germany and brought cultural marxism to America. He is a propagandist for the left, nothing more. HIs website: http://www.history.ucsb.edu/faculty/marcuse/. I think you should put some of your sources in context better than you do. Books are so full of lies. Sybille Steinbacher’s book Dachau: The Town and the Concentration Camp is not listed on Amazon. Maybe you bought it in the Dachau bookstore. The Hitler Virus by Peter Wyden is another junk book, which is now selling at Amazon for one penny. You may at one time have thought you would find truth in these books, but surely you know now that is not the case. Therefore I just think you should convey that to your readers. Aren’t there any revisionist books that contain information about Dachau? I know a woman who was a girl of 12 or 13 living in Dachau at that time. She believes still what the U.S. Military told them, although she knows nothing first hand. She is tired of hearing about the “Nazis” all the time though, she said. Italianists will be interested by this book, Dachau. Testimonio De Un Superviviente. You can read it here. Furtherglory and his history buffs followers might be passionate about the recently publishedThe Mauthausen Trial: American Military Justice in Germany by Tomaz Jardim. You can read it here. Nerin E. Gun’s book The Day of the Americans was the first book that I read about Dachau. I have many quotes from his book on my website. Is there an English translation of this Italian book? I re-read your blogs; I had not noticed the recurrence of Nerin E.Gun’s name. I scoured the Net for an English version without success; I’ll let you know if I’m more lucky later.